Max Fitness heavy duty Weights Bench. Quality white powder coated steel construction. Super quality and easy to clean. Padded PU bench for comfortable training. 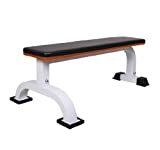 This high quality durable flat weight bench is perfect for dumbbell workout and practices your muscle.